From the Argentine romantic composing a tango to the K-pop star strumming for an audience of thousands, guitars are a favorite instrument around the world. In fact, the guitar is the second most played instrument after the piano. (source). Amateur and professional players use a variety of playing positions - some are significantly more ergonomic than others. In the classical position, the guitar is sharply angled up so that the wide end of the instrument’s body sits against one leg and the neck is held aloft with the opposite hand. This position allows the musician’s shoulders to be square and resting more posteriorly in line with the back instead of rolled forward as in the modern style of playing with a horizontally aligned guitar. 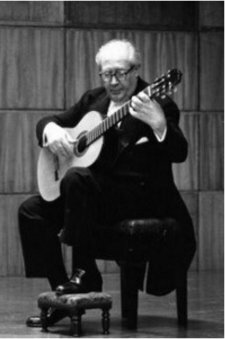 The picture of Andres Segovia above shows the classical guitar-playing style. We can see that his shoulders remain home - they are open and back even while his arms reach forward to hold the frets and pluck the strings. In addition, his shoulders are relaxed and slope downward. His eyes look down at the instrument but his neck remains vertically aligned with his torso. While not overtly visible, his pelvis seems to be slightly rotated (anteverted), which allows his back to stack upright. His positioning allows him to play for long periods with ease in spite of his advanced age. Segovia uses a footstool to help keep his guitar at a 45 degree angle. In the image above, we see a rest placed between the instrument and the thigh to support the guitar. The support allows the player to keep her right shoulder farther back while playing. Generally, when standing, a strap is used to keep the guitar elevated. 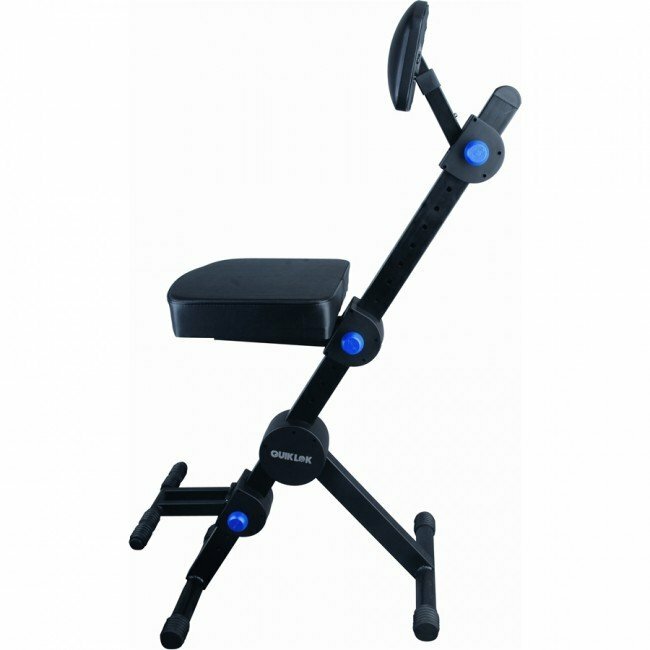 Regardless of the support used, the goal is the same - to maintain healthy posture while playing one’s instrument. In the image below, we see the opposite - the guitar is played in a way that compromises the player’s posture. This very common playing position used is likely to cause her pain and injury despite her young age. Her right shoulder is rounded forward as she reaches for the strings and her head and neck are jutting forward for a better view of her playing. In addition, her pelvis is tucked, which causes her spine to round forward instead of stacking. Unfortunately it is not uncommon for musicians to develop sciatica, tendonitis, nerve damage, and arthritis, and careers can be cut short because of bad playing habits. It is critical to the health of the life-long guitarist that the instrument be held to accommodate healthy posture instead of distorting the posture to accommodate a poorly held guitar. This distinction is important. In the modern era we are quick to change positions to accommodate cellphones, computers, desks, and heavy bags. However, we need our bodies to last us nearly a century, so it is imperative that we endeavor to live our lives in ways that maintain our postural integrity. It's delightful to recognize the ongoing mastery of a subject, in this case correct posture while sitting. Although I have been practicing the basics diligently, this article deepened my understanding of proper neck alignment and relaxed shoulders. It flashed into my mind beyond mere intellectual comprehension. Line upon line, here a little, there a little--that's how we learn until it becomes the life. So happy to hear about how you are embodying this! Typed this in google (good shoulder posture for guitar) and this came up. You really cover everything! So glad I found this. I already play in a mostly classical guitar position, but this is still helpful and a great reminder. Up until somewhat recently I have played guitar with horrible posture for close to 14 years and my shoulders are super rounded. Started to do a lot of peck and trapezuis stretches to free them up.Thank you! So glad Google brought you here - welcome! It is so important to have good posture when playing guitar. for practicing, I invested in a guitar stool which is fully adjustable. 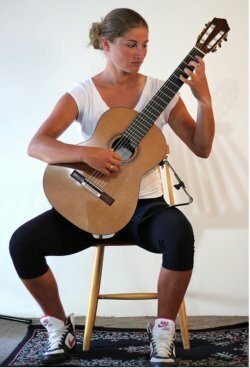 I am able to set the guitar stool up in such a way that I can achieve the best possible posture for optimum practicing and playing. I can now practice guitar for much longer since getting one of these.